WASHINGTON — The extensive chains of Pacific islands ringing China have been described as a wall, a barrier to be breached by an attacker or strengthened by a defender. They are seen as springboards, potential bases for operations to attack or invade others in the region. In a territorial sense, they are benchmarks marking the extent of a country's influence. "It's truly a case of where you stand. Perspective is shaped by one's geographic and geostrategic position," said Andrew Erickson, a professor with the China Maritime Studies Institute at the Naval War College. "Barriers is a very Chinese perspective," said Erickson. "It reflects a concern that foreign military facilities based on the islands may impede or threaten China's efforts or influence." The springboard concept can work offensively or defensively. "Many Chinese writings express concerns that the chains can be used as springboards for projection and forces against China. But some sources imagine future contingencies where China itself might have growing influence and presence, with Taiwan being most relevant in that regard," Erickson said. "Benchmarks speak to the idea that as China increasingly engages in blue-water operations and limited forms of power projection, having more ships through the first island chain offers a set of milestones by which the People's Liberation Army Navy – or PLAN – can measure its growing presence and capabilities." Senior officials and analysts in the West frequently refer to the first and second island chains ringing China to describe both the region's geography and predict Chinese intentions. Erickson, in a new paper co-authored with Joel Wuthnow of the National Defense University and published in The China Quarterly, carried out a comprehensive, five-year examination of Chinese literature to determine how mainland China views the chains. He reported that the idea originated in the west during the Cold War – Chinese sources often credit 1950s US Secretary of State John Foster Dulles as the concept's progenitor. But the notion, Erickson pointed out, isn't new – it derives from the region's physical characteristics. Still, the chains have risen in political thinking to become benchmarks that in many ways define the field of play as China's regional maritime power expands. "You won't find in a single authoritative source a precise official consensus on what the chains mean," Erickson said. "But if you look at a variety of Chinese sources you see a larger pattern that speaks to Chinese concerns about foreign sources having influence over the region and over outstanding disputes. This is not a figment of China's geostrategic imagination." Those concepts play out in numerous fashions, from the weapons China develops to the kinds of exercises and operations the military carries out. "It looks like we're seeing a broad-based Chinese effort to become familiar with a variety of different ways to get through the island chains," Erickson noted. "It's not hard to imagine that China would want to develop experience with as many different ways as possible to get through the chains." China's development of short-range ballistic missiles is also related to its thinking about the first island chain, Erickson said. "The vast majority of those weapons appear targeted at Taiwan, which many Chinese authorities see as a key point in the first island chain," he said. "The vast majority of the missiles I've mentioned are designed to target very specific land bases. It's only very recently that we see a small but growing portion of conventional ballistic missiles developed with the intent of being able to threaten US and perhaps allied naval vessels." The Chinese Navy, Erickson pointed out, operates the world's largest conventional submarine missile force. "The vast majority of those missiles having the right range to appear to be targeted at various US and allied military bases in the region, almost all of which are somewhere along the first island chain." 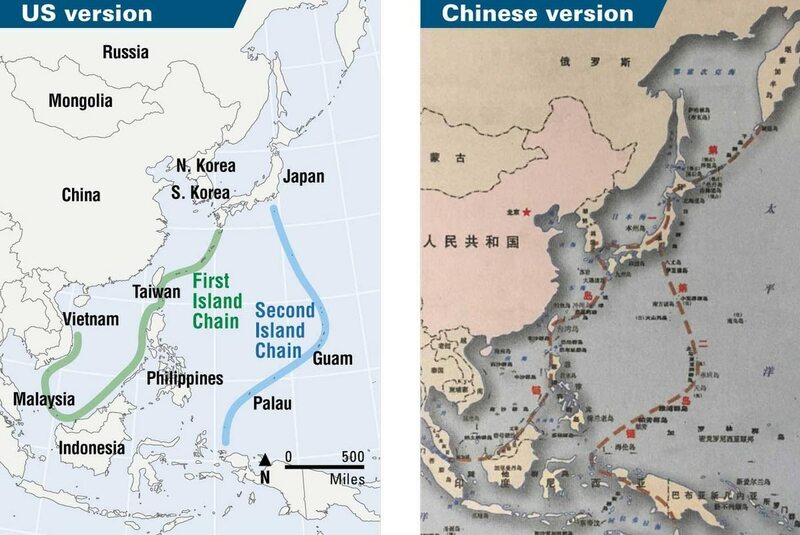 Subtle differences in how the US and China view the chains are evident, Erickson said, in maps produced by the US Defense Department and the Chinese Navy. The Pentagon map, he noted, "doesn't show South Korea as part of the chain, but the PLAN book very much does show it as belonging to the first island chain." Another key difference is in how the Chinese depict the chains joining up in Japan, stretching across the Sea of Okhotsk to the southern tip of Russia's Kamchatka peninsula – a feature absent from the US map. The differences indicate different ways of thinking about the chains, Erickson said. "I don't think the DoD map is the best possible expression about how the Chinese Navy thinks about the chains – the PLAN map is," he noted. "This is a case of differences in nuance, not in fundamental differences. I don't think DoD has gotten this wrong, it's just a different focus." China's recently aggressive island-building strategy, Erickson observed, is related to the springboard and barrier concepts. "The chain traditionally has made use of existing geography, but you could argue that China is now making its own island chain – as a springboard for itself and to create a barrier to others," Erickson said. "I haven't yet seen Chinese sources that refer to this artificial island construction development as an island chain type thing, but if we look at it conceptually we're really talking about similar things. That's one reason I think there's so much US, regional and allied concern about Chinese activities in the South China Sea." Among countries in the region, Russia and Korea are less involved with island chain concepts. "Russia has bigger geostrategic problems to worry about," Erickson said, while South Korea "by necessity is so focused on security threats from the north that that is the fundamental factor affecting their nation's geostrategic orientation." Japan, across the seas from Russia and Korea, is in a different position. "In many ways Japan is as central to island chain thinking as one can get," Erickson said. "Japan constitutes the largest portion of the first and second chains as any other nation. It is a nation of more than 6,000 islands. It is as close to a natural sea power as a nation can get." "Back when imperial Japan was trying to gain control of the first, second and even a third chain – the Aleutians – there was a concern that if Japan didn't control the Philippines, Guam and Hawaii the Americans would, to Japan's geostrategic detriment," said Erickson. "At the outset of World War II, Japan made an extraordinary effort to use part of the chains as a springboard, and they were indeed benchmarks of Japanese military progress. That was only halted then the US turned island-hopping in the other direction. "Today, Japan is concerned about Chinese attempts to influence and control areas and to develop weapon systems vis-a-vis these island chains," Erickson added. "And there's a lot of Japanese concern about ongoing Chinese efforts to penetrate the chains using increasingly powerful and complex groups of naval vessels. I think Japan feels very much connected to these island chains. As China looks to the chains and aspires to do things, I think Japan feels very targeted by that, it feels it very acutely." Taiwan, unsurprisingly, often stands out in the attention it receives in Chinese writings. "Many Chinese sources emphasize their view of Taiwan's status as a key node on the first island chain," Erickson said. "Some Chinese sources see this not only as a springboard against mainland China, but a number of sources express aspirations of eventually [bringing the island] under mainland control, perhaps in a very robust fashion that would allow for some form of Chinese-controlled military facilities. We see discussion of ports, particularly on the east coast of Taiwan, allowing for China to conclusively break out of the confines of the first island chain once and for all. "I see no other part of an island chain that is really in the category of what some Chinese strategists ultimately aspire to control and own themselves," Erickson said. "That definitely sets Taiwan apart." "A number of Chinese sources see this as a rear staging area for US and allied forces," Erickson said. "But the second island chain will grow in China's geostrategic thinking. As China continues to send naval forces afield, it will be a benchmark." Over time, he added, "China can do more to hold Guam and other parts of the second island chain at risk."